Ian Arthur Harcourt Perry was born in Brisbane on 16 December 1916. In 1934 he served in the Militia for two years. 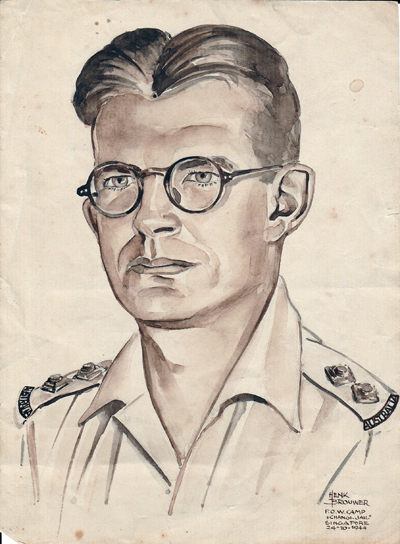 In 1938 he rejoined the Militia as a member of the Coastal Artillery, later he enlisted the Australian Imperial Force. As a member of Sparrow Force, he had to defend the island of Timor. During the Japanese invasion, the Japanese outnumbered the defending force almost by seven to one. As a result, the allied capitulated soon. Perry was emprisoned in Timor, later in Changi, Singapore. As part of the “F” Force, he was forced to work at the Burma Thailand Railway or Death Railway. When the railway was finished, the captives of the F Force who had survived, were brought back to Changi. After the war, Perry returned to Australia. He turned into a very successful business man, owning and running a company for the production of window fittings. It expanded from a small agency in 1945 to a company manufacturing in three countries by the time Perry sold it in 1960. He also held several directorships in a number of Australian quoted companies. Perry was also an active volunteer, contributing in areas as diverse as the education of deaf children, road safety, better farming practices and his local church. He was a good family man, who enjoyed nothing more than spending time with his wife, children and grandchildren.